Morning Professional Development Seminar - 10:30 a.m. - 11:45 a.m.
Chris Roelke, President, What If? How did your year-end campaign perform? Did you crush it? The truth is we can all do better….but how? This morning’s presentation will give you 12 tools to help you leverage Facebook, email and direct mail. Drawing upon 15 years of direct response expertise working with direct response budgets from $5,000 to $1M, our speaker will share actionable tips you can put to work immediately, including three secret tools you probably aren’t using (and it could be costing you donations). ……and create a system to crush it in years to come. Go to www.whatiftalk.com/afpglac for more information and to submit questions. 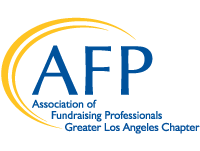 Luncheon Topic and Speaker - 12:00 p.m. - 1:30 p.m.
Gregg Sherkin Senior Vice President leading Corporate Philanthropy and Community Relations in Southern California for Wells Fargo. Los Angeles is a great place to live and work. While we are fortunate to be living here during an unprecedented period of prosperity and economic growth, many communities are facing increasing hardship and are at risk of being left behind. Join fellow nonprofit and fund raising professionals to learn how Wells Fargo is working to identify and help address some of the greatest needs in communities throughout LA.